Philip Rasansky will be returning to North Star for summer number eight. One might say that he shares some of the same interests as his twin brother, Parker. Philip is a sophomore at the Greenhill School, where he is on the basketball and baseball teams. He is also part of BBYO (the B’nai B’rith Youth Organization”) Young Men’s Service League. Philip will be a counselor in training this summer. He is looking forward to instructing ultimate, football and basketball. Parker Rasansky is one of three Rasanskys that will be a CIT this year, including his twin brother, Philip. Its been a while since we’ve had twins on staff. Parker hails from Dallas, TX where he is a sophomore at Greenhill School. Parker is on the school basketball team. They just ended their season with a 17-5 record, including a 25 point victory over their rivals. He’s not gearing up for the baseball season and their team looks to be pretty good. At North Star Parker will instruct disc golf, softball and basketball. Eli Fried comes to camp from Leawood, Kansas. He’s a sophomore at Blue Valley North High School, in Overland Park, a suburb of Kansas City, Kansas. He wants to reaffirm that he doesn’t live on a farm or know Dorothy, At home, he’s active in his BBYO Youth Group chapter, Nordaunian, and in his FIRST Robotics team, the Metal Mustangs #2410. A Counselor in Training this summer, this will be his 8th summer at NSC and he’ll be instructing rocketry. Ned Shashoua returns to North Star for summer number seven. Hailing from Boca Raton, FL, Ned is a sophomore at Pine Crest School (no relation to the old Spider Lake resort). Ned was actually born in Dallas, TX, however he’s a fan of Chicago sports teams. As for playing sports, soccer and tennis are Ned’s specialties. 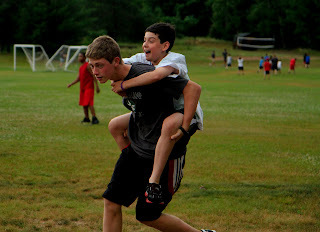 He’s also another one of our CITs who has a brother at camp. We’re looking forward to having Ned back as a tennis and athletics instructor. Chip Kass, affectionately referred to as “TinyTiny” by Leb returns to North Star for his eighth summer. He’s from Highland Park, IL, where he is a sophomore at Highland Park High School. He’s involved with the theater and choral programs and is currently performing in the musical, Jekyll & Hyde, with fellow NSC'ers Brett Sametz and Jacob Baim. During first session this summer he is going to be at Stagedoor Manor, an acting camp in New York. We're glad to have Chip as one of our great Counselors in Training. At camp, Chip will be instructing sailing, theater games and fishing. Josh Devorkin spends his off season in tropical Mequon, WI. He is a Sophomore at Homestead High School, where he has been on the varsity swim team. He recently swam conference and qualified for sectionals. He has a great chance to swim at state. He is on a traveling lacrosse team and played a tournament in Maryland. Josh is also involved in BBYO. 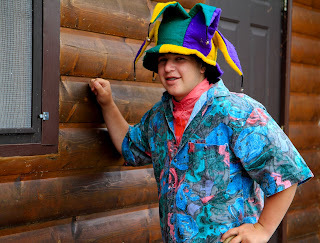 Josh will be one of our Counselors in Training and at camp he’s looking forward to instructing a variety of athletic projects as well as canoeing and mountain biking. Sports team that you root for: PACKERS GO PACK GO!!! Earliest camp memory: the first Friday night services having the amazing sunset in the background and looking around and seeing how many friends I had made the first week I had been at North Star. Each February we head over to the ACA National Conference. It gives us the opportunity to learn from great speakers, collaborate with others from all over the camp industry and get great ideas for the coming summer. One of the great Keynote Speakers was Richard Louv, author of "Last Child in the Woods". Richard is a great advocate of getting people into nature, particularly as we become more attached to technology. Check out his blog for some of his writings. This year's conference brought us to Atlanta, which isn't exactly San Diego (our 2011 conference site), but its a great city. We also come down to the conference to catch up with camp friends. Little did we know that we'd be seeing some North Star friends and also have a great small world story to pass along. Andy and I got to the hotel, headed up to our hotel room and were entertained by the Cheerleader Conference that was taking place at our hotel. As we headed back down to meet up with Leb and Sue, we noticed that there was a group of teenage males streaming out of a room, with BBYO badges. I look over at Andy and say "we could run into..." and I didn't even finish my sentence before Andy points and says "him?". 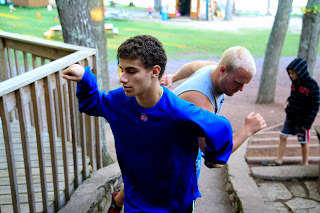 Walking towards us was Jordan Schack, and he was soon followed by his brother Jonathan Schack (counselors from 2011 and former campers). They were there for the BBYO conference and were, needless to say, pretty entertained to see us. Jordan and Jonathan are enjoying their senior years of high school in St. Louis. Jordan is getting ready to head off to University of Pennsylvania in the fall while Jonathan is still in the college search process. The conference ends tomorrow and we'll be sure to pass along some details and highlights, but nothing as entertaining as running into the Schacks! Scott Plonsker returns from Deerfield, IL where he is a junior at Deerfield High School. He is active in competitive karate, and his competition season just started and lasts until the summer He is training for the US open which is in April in Vegas. Scotty has also been playing indoor soccer. Scott is also organizing a self defense class for charity through the Key Club, a charity group that he’s involved in at school. Proceeds those proceeds will go towards longevity and you can find more info at: http://on.fb.me/x7s6bm. Mark Yellon hails from Chicago, IL where he is a junior at the Latin School. He has been playing indoor soccer for his school and basketball for his Jewish youth group. He is quite proud of the fact that his team team beat Danny Verb's team. He has been doing community service and fundraisers for a local soup kitchen 2 Lil Fishes. In March, he will be doing a one week indoor racing project with my school. At camp, Mark instructs a variety of projects, including climbing and sailing. Best place you've ever traveled to: Israel in 8th grade. What a cool place! Favorite spot at camp: Council Ring is the best, but the blob/ waterfront area is also a great place to chill out and get a tan. earliest camp memory or notable camp memory: Walking off of the bus my first year and instantly loving North Star! Jake Spungen hails from Lake Forest, IL, where he is a junior at Stevenson High School. There he is involved with the school’s radio station and the community service club. He is also on the basketball team. We’re glad to have Jake back as a basketball, softball and disc golf instructor. Best Hanukkah present that you've ever gotten: a patrick kane jersey. the hawks are my favorite! We love our North Star Family! We can't tell you guys enough how much we appreciate you being part of the North Star family, and Valentine's Day is just another great occasion to tell you how much we love you. As of today, February 14th, camp is only 125 days away and we can feel the excitement building. If you check out the February Siren, you will see why. 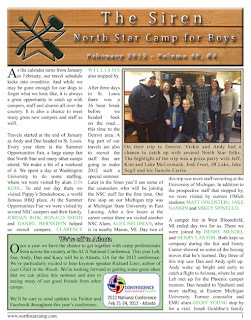 In it you can see many of the campers and staff that will be at camp for the Summer of 2012, and read about the traveling around the country that we have been doing to make sure that we have the world's greatest campers and staff. If you love what you see at North Star, and haven't yet signed up for this summer, you can Register Online. And as always, we hope that you'll Spread the Word about North Star to those that you love! Michael Lee hails from Riverwoods, IL. He is a junior at Deerfield High School and this will be his 8th summer at North Star and his 2nd on staff. He’ll only be at camp for the first 4 weeks as he is doing a program on International Diplomacy at American University towards the 2nd half of the summer. He recently participated at the Model United Nations conference lead by the University of Chicago. He placed as the Outstanding Delegation in the Economic and Financial Committee. He's also on the DHS Student Congress Congressional Debate team, is running indoor track and preparing for the outdoor track season. 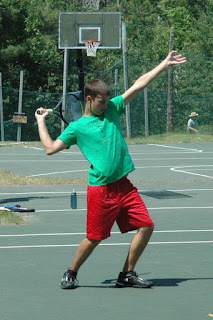 At camp he instruct tennis, disc golf and other athletics. Doing his rendition of The Bangles hit "Walk like an Egyptian"
Nick Kasle hails from River Hills, WI where he is a senior at Nicolet High School. Nick returns for summer number seven and brings his great sense of humor. Nick is on his school’s tennis team and at camp he can be found in a multitude of areas, on the waterfront at waterskiing, in the arts and crafts. Nick also enjoys Larping (or Live Action Role Playing). As a matter of fact, Nick has his own larping sword (totally safe) that he occasionally will bring out for some entertainment. He has been attempting to form a larping squad at his high school, and we have faith that Nick will be successful! We're thrilled to have him back at camp this summer! Favorite camp meal: Grill cheeze! Favorite spot at camp: Smudge's grave in the council ring. Earliest camp memory: walking off the bus my first year and meeting Ben Mizel, thinking he was a real nice guy with baller status. If you could have a superpower, what would it be: To have one wish that will automatically come true, then wish for a 1000000000 wishes. Preferred chicken nugget dip: whatever suits my mood. Danny Verb returns for summer number eight. Hailing from Riverwoods, IL, Danny is a junior at Deerfield High School. He’s getting ready for the volleyball season, which begins in the spring. At camp, Danny can be found on the climbing project as well as on soccer, ultimate and volleyball. Danny (R) with his younger brother Kyle (C) & John Lee. While certain other NSC Omaha residents occupy the Nebraska spotlight, Jacob Lehr shows his Husker pride in a more subtle way. Jacob may not be quite as outspoken or up front in his love for the team that plays in Lincoln, NE as schoolmate and fellow counselor Oliver Rockman is, but that doesn't make him any less of a fan. Jacob returns for summer #8 at North Star. He's currently a senior at Westside High School in Omaha. There he’s a four year member of the school’s tennis team. We’ll put those skills to good use at North Star where he’ll instruct tennis as well as disc golf and golf. 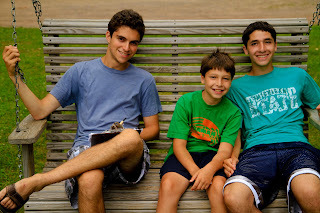 His dad was a camper at North Star, too, making Jacob one of our second generation guys. We're thrilled to have him back. Preferred chicken nugget dip: Definitely BBQ. No one calls balls and strikes like Jacob!